Find flight deals to New Zealand and top 10 ideas for a better way to New Zealand travel below. 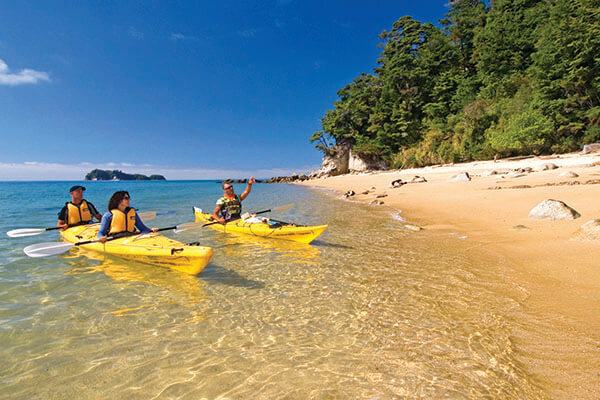 If you want to visit New Zealand for the world-famous scenery and serenity, we can help. If you want to eat and drink in a country that’s famous for the high quality of its cuisine, we know all the best places. And if you want to re-energise with easy outdoors adventures, we’re full of ideas. All fares are only applicable for NZ281, NZ282, NZ283 and NZ284 unless stated otherwise. *All prices are quoted in Singapore Dollars (S$). Singapore to New Zealand round-trip fare includes airport taxes of S$114. Tax is subject to currency exchange fluctuation. Final tax amount will be calculated upon confirmation of booking. The above fares apply to NZ-coded flights between Singapore and New Zealand operated by Air New Zealand (NZ281/ NZ282/ NZ283/ NZ284)) only, with a travel period from 05 May 2019 - 10 Jul 2019 28 Jul 2019 - 26 Oct 2019. Seats are limited for the above fares and offered on a first-come, first served basis. Passenger(s) must book online at airnewzealand.com.sg. Cancellation is non-refundable for K, G, J class and a chargeable fee of USD 200 for A class. Changes are non-refundable for K, G, J class and a chargeable fee of USD 200 for A class. No-show is non-refundable for K, G, J class and a chargeable fee of USD 200 for A class. See detailed fare conditions. Additional payment may be required if original fare not available or applicable. Tickets are not transferable to another person. Air New Zealand reserves the right to change the above conditions and any routing exclusion without prior notice. Other restrictions may apply. The Economy class fare is only applicable for NZ281, NZ282, NZ283 and NZ284 with 1 stopover in Auckland. The Premium Economy and Business Premier fares are only applicable for NZ3297 and NZ3298. All fares are only applicable for NZ3247 and NZ3248 unless stated otherwise. All fares are only applicable for NZ281, NZ282, NZ283 and NZ284 with 1 stopover in Auckland. Your flight to New Zealand from Singapore will land you in Auckland, a spectacular city built between two huge harbours. From a downtown hotel, it’s easy to catch day-trip ferries to the beautiful islands of the Hauraki Gulf. Visit Waiheke Island for wine touring, Rangitoto for a volcanic summit hike or Tiritiri Matangi to see rare birds. At Waitomo, you can venture underground to discover glow worms and magnificent limestone formations. Drift gently through the caves in a boat or lift the adrenalin levels with a black water rafting tour, where you’ll float along underground streams on an inflatable tube. You can combine Waitomo with a trip to the Hobbiton movie set. In geothermal areas, spouts of boiling water climb into the air powered by the volcanic energy below. Craters of boiling mud, multi-coloured terraces and naturally-heated spa pools are other natural wonders to look forward to. Rotorua is also a great place for Maori cultural experiences, including delicious food cooked in a hangi (earth oven). If you love beaches and easy walking, this coastal track around the edge of Abel Tasman National Park is your kind of expedition. You’ll discover secluded sandy coves, native forest, interesting wildlife and fascinating rock formations. You can also explore this extraordinary park on a boat tour or kayak expedition. New Zealand’s cool little capital has a brilliantly interactive museum – Te Papa Tongarewa, in Wellington. Until April 2019, you can see the Great War Exhibition, a ground-breaking museum experience created in collaboration with Lord of the Rings movie director Peter Jackson and Weta Workshop. 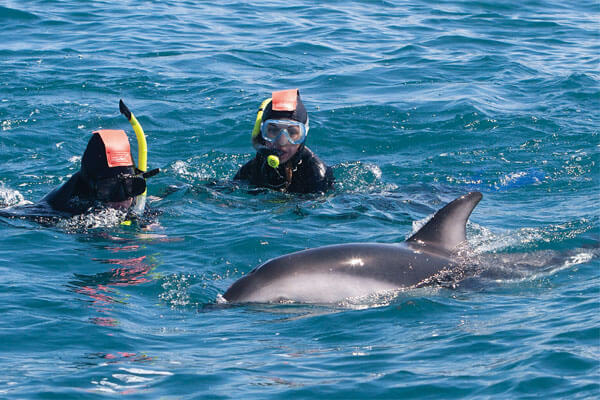 From friendly Kaikoura township, which is sandwiched between a massive mountain range and the ocean, you can see huge whales, New Zealand fur seals and dolphins on wildlife cruises. Don’t forget to order delectable local crayfish (lobster) at local restaurants. Enjoy short woodland walks, then relax in mineral-rich, naturally-heated pools at the South Island’s premier thermal spa resort. There are water slides too if you’re feeling playful. Hanmer Springs is particularly beautiful in autumn when the deciduous trees turn every shade of yellow, gold and red. See the charming Church of the Good Shepherd on the shores of Lake Tekapo, hike up mountain trails in Mount Cook National Park and watch the heavens at night (stargazing) from the Mount John Observatory. There’s also a wonderful hot pool complex here when you can enjoy gorgeous views of across Lake Tekapo while you soak. Apart from extraordinary alpine scenery, Queenstown is the adventure capital of New Zealand. There are tranquil activities, such as golf, walking, horse riding, lake cruises and biking; and there are big thrills, like bungy jumping, skydiving, parapenting, canyon swinging and jet boating. Life is never boring in Queenstown! 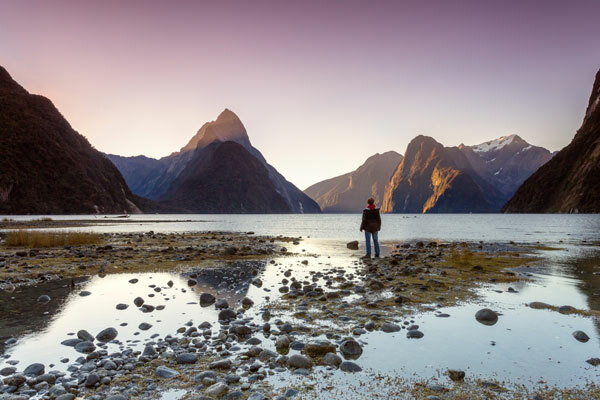 Easily accessed from Queenstown or Wanaka, Milford Sound was carved by glaciers in the last ice age. Mountains rise hundreds of metres above deep, clear waters; roaring rivers from deep within the forest suddenly find themselves in thin air and plummet as spectacular waterfalls to the sea below. It’s like the land that time forgot.